Film maker and artist Nico A. Eloranta has created a pretty cool light painting documentary called “Lightpainted Reality” on light painters Janne Parviainen, Hannu Huhtamo, and Pekka Parviainen. After watching this 26 minutes of light painting goodness read the interview with Nico (below) to learn more. LPP ∇ Hey Nico thanks for sending this my way. I like the doc. you really captured that spirit of exploration that light painters have, why did you make this documentary? Why light painting? NE ∇ I have done some video work before and those projects have been mainly fictional stuff. I had dreamed for years to make some kind of documentary but never figured out what it could be about. One day few years ago I was speaking with Janne Parviainen and then it hit me… he was totally falling into light painting and I was just fashinated about his photos… so why wouldn’t I make a documentary about light painting, about Janne and his friends. LPP ∇ Did you know the artist in this documentary before you decided to make it? NE ∇ Yes, Janne has been a good friend of mine for years so it was easy to start making documentary with him. Hannu Huhtamo and Pekka Parviainen were doing light painting stuff with Janne before so it was also easy to get them excited about the idea of this documentary too. LPP ∇ How did you all meet? NE ∇ I met Janne at arts school back at year 2006 and after that we have done many art and video projects together. Hannu and Pekka I had met before making the documentary too, so I knew the entire crew before starting to make the documentary. LPP ∇ How did they react when you told them what you wanted to create? NE ∇ They were all excited about the idea of the documentary. And at the time we started to shoot the documentary the dudes hadn’t gained as much publicity as now with their light painting art so we all thought that the documentary is a cool way to show their talent. LPP ∇ Were they all open about their techniques, or did they want to keep them secret? NE ∇ As one can see in the documentary the guys were really open to show what they do and how they do it. So, no big secrets were kept from the audience. The difficulty was to get it all captured in the darkness as not too much lights could have been used as the technique itself needs darkness around the process. LPP ∇ Were they easy to work with? NE ∇ Yes, the experience were absolutely rewarding and interesting. I think we all enjoyed the light painting trips together. I had promised that I wouldn’t be in their way as they do their light paintings and I shot the documentary as a kind of a bystander. 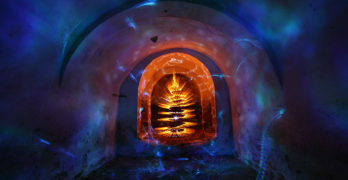 And I was happy to get to help to do few light paintings too so I got to be part of the process. LPP ∇ How long did it take to shoot and edit this film? documentary I had about 12 hours of footage to start editing with. The actual editing took about five months then as I had an other job too while doing this project. The first edition of the documentary was about 45 minutes long, but after watching it numerous times I thought it should be edited more to keep the flow and feeling as I wanted it to be. LPP ∇ What was the worst part about making the documentary? NE ∇ As we are speaking about light painting which mostly happens in dark surroundings it was really hard to shoot the actual process with video as I didn’t have a ir-camera at my use. For video light I mostly used one headlamp and even that had to be turned of most of the time for not to violate the light painting process. So there were lots of pitch black footage on video when I started to check the materials thru. It was also really hard to focus my videocam at the dark as automatic focus didnt work at all. And the lights were on and of in short periods when guys did their paintings so I had to be fast to get them on screen and focused as they did their stuff. LPP ∇ What was the best part about making the documentary? NE ∇ The places the dudes like to do their light paintings are really interesting and sometimes kind of creepy so every trip was an experience itself. It was cool to wonder around places at night time and in total darkness. That was something I wouldn’t propably do in my everyday life. LPP ∇ You shot at night a lot in some pretty sketchy places did anything out of the ordinary happen? Any scary moments you would like to share? NE ∇ I don’t recall any actual dangerous or creepy things to happen while shooting this documentary even if some of the places were scary on their own at night time. But ones imagination can play tricks in such a surroundings and of course some creepy voices and stuff were heard many times. LPP ∇ What are you doing with the documentary? NE ∇ I tried to submit this documentary in various documentary and short film festivals around the world but hadn’t any luck with it so far. Maybe I now hope that someone would find this documentary via internet and would offer some kind of display opportunity somewhere, sometime…who knows? 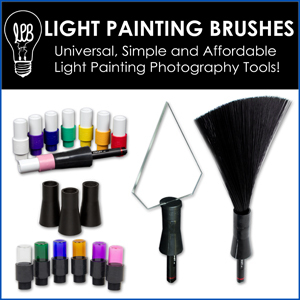 LPP ∇ Are you a light painter? NE ∇ I am not a light painter myself. Only light painting I have made was the titles for the documentary with the guys even if that wasn’t even actual light painting I think. But we did stencils and all, so the process was quite similar as some light painters use. And I have been in few light paintings of Janne to assist him which have been a blast. I bought a camera while doing the documentary with the idea to try light painting myself. But never had enough time for it so already sold the camera and desided to stay with the art forms I already know. I do glass-, metal- and videoart. LPP ∇ Thanks for taking the time to answer some questions Nico great work.